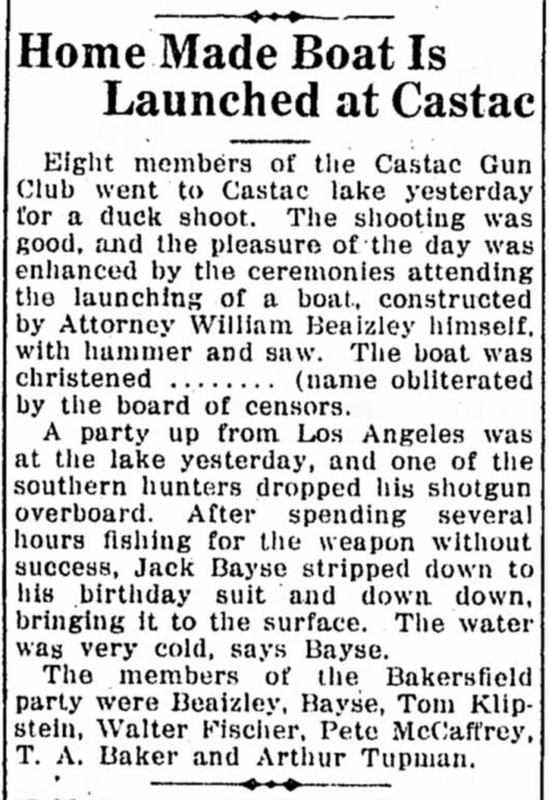 SCVHistory.com | Lebec-Tejon | Naked Hunter Retrieves Shotgun from (Original) Castaic Lake, 1915. Naked Hunter Retrieves Shotgun from (Original) Castaic Lake. Bakersfield Californian | November 22, 1915. The real Castaic Lake (initially spelled Castac or Castec) is a natural lake in Lebec, east of Interstate 5, on Tejon Ranch Co. property. It's still in its natural state in 2014, although it is slated to be surrounded in the near future by the Tejon Ranch Co.'s first major housing development. The larger water body to the south, in the town of Castaic, is a man-made State Water Project reservoir that was constructed in the late 1960s and early 1970s. According to his obituary, the boat builder, William Beard Beaizley (Jan. 8, 1866 – Feb. 19, 1944) was born in Australia and came to Bakersfield in 1907. An attorney, he represented the Kern County Land Co., the Santa Fe Railroad, King Lumber Co. and other area firms. Home Made Boat Is Launched at Castac. Eight members of the Castac Gun Club went to Castac lake yesterday for a duck shoot. The shooting was good, and the pleasure of the day was enhanced by the ceremonies attending the launching of a boat, constructed by Attorney William Beaizley himself, with hammer and saw. The boat was christened ........ (name obliterated by the board of censors). A party up from Los Angeles was at the lake yesterday, and one of the southern hunters dropped his shotgun overboard. After spending several hours fishing for the weapon without success, Jack Bayse stripped down to his birthday suit and down, down, bringing it to the surface. The water was very cold, says Bayse. The members of the Bakersfield party were Beaizley, Bayse, Tom Klipstein, Walter Fischer, Pete McCaffrey, T.A. Baker and Arthur Tupman.